I’m not the biggest fan of New Year’s resolutions. I certainly think that they can work for some people, as the start of a new year can be a good time to refocus your goals and look back on the things you’ve accomplished over the past year, but I don’t see the need to wait until January 1 to make changes. If there’s something I want to change, I like to start making strides toward changing it right away rather than waiting for a specific and arbitrary date to get started. 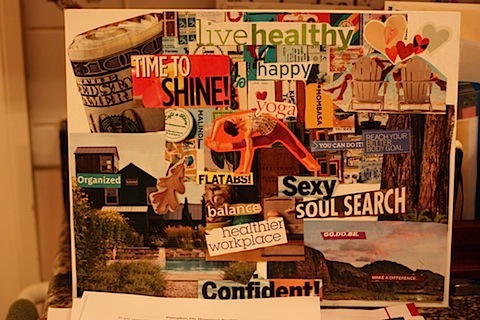 I have several goals in all aspects of my life but since this blog is focused on health living, here are my health goals for 2011. Some of these goals I’ve been working on for a few months and plan to continue them in 2011 and some are brand new. With all of them, I wanted to make a deadline or time to reassess because sometimes goals can slip away if you aren’t tracking and evaluating your progress. Fit in my new (and old) jeans: Over the past few months, all my jeans have been feeling tight and there are even a few pairs that I’ve just been avoiding all together because I knew they would be too snug to wear comfortably right now. Then last month I won a pair of Seven for All Mankind jeans on Twitter so I ordered the size that I normally wear. Well… I can get them on, but they don’t really zip and they definitely don’t button. I’ve wanted a pair of Seven jeans for over 5 years and now that I have them I can’t wear them. :/ Needless to say, “Project Fit into my Jeans” needs to start ASAP. I want to get back to eating real foods, drinking enough water, eating less sugar (#3), and focusing on exercise to get in better shape (#2). (I plan to reevaluate this goal in 6 weeks). Overall I’m very excited for the year ahead – all of my goals (both health and personal) are fully obtainable. All I need to do is put my mind to it! I’m sure many of you have set goals for yourself as well so here’s a few quotes to keep us all motivated. I wish I had that board up on my wall, it’s so inspiring, and it totally looks like something that I would see in LuluLemon. Great goals! I love your inspirational board. I will have to make one. I have many favorite quotes. One of them is, “It’s never too late to be what you might have been.” Happy new year! Happy New Year and good luck with your positive changes! I have the exact same jeans problem and cannot wait to fit back in! i keep meaning to make a board like that, because i know i have all the pictures! i tear apart magazines all the time! yours looks great and so do your goals! i’m sure you’ll do great! Happy New Year and GO TEAMHEAB! HAPPY NEW YEAR SWEET HEART!!! Just made my inspiration board too!! Funny enough, my jeans aren’t fitting too well anymore either. I’m upping the strength training because whenever I do my clothes just fit so much better, and I FEEL better as well. Good luck in 2011! I really want to get back into shape after I have this baby. That’s my biggest fitness goal. A lot of little things go into it too though – like running my first race. I’m so ready to get started. Should only be a couple more weeks until this baby is out though. Sugar cravings seems to be a reoccurring theme in blog world lately. Definitely makes me feel better since I’ve been struggling with this myself in the past few weeks. Good luck with your goals! Great goals! I love your inspiration board. I’ve got the same thing goin on with my favorite pair of jeans. They are just a wee bit snug, and while I don’t need to lose any weight I would love to tone up and feel better in them! Good luck! This is a great idea. I don’t really like making New Year’s Resolutions because I never seem to keep them. Making an inspiration board is a nice tweak on the resolution tradition and hopefully one that will make me stick to my goals. You’re not the only one who can’t fit in her jeans. I’ve been avoiding wearing mine because I know they’ll be tight. We can do it! Your inspiration board idea is great. I think I might need to make one of my one. Happy New Year and here’s to fitting into new and old jeans! I definitely have a few pairs I am avoiding since the holiday season! I need to update my vision board, yours looks so good. I need to get away from the sweets too, I have been a bit out of control too. All my inspirational, motivational quotes come from the bible and my dad. I should compile them and read them from time to time to motivate myself whenever things get down. This is a great post to begin the year with. I love the goal mentality. I don’t make resolutions, but I do like to begin the new year with purpose! Your inspiration board is a great idea. I may need to get clipping and pasting tomorrow morning. Thank you for sharing with me. I hope you have a happy Tuesday! I can relate to each and every goal. I’m right there with you! Agreed on resolutions, change should happen when needed. 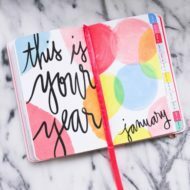 Great goals for the new year! Thanks for the great blog and ideas! You’re an inspiration! Hi Jaina. Thank you so much for your kind words and please let me know if you enjoy the recipes that you try. I LOVE that quote. I think I need to write that one down for myself!! Well, I wish you the best! I know that you can make those goals come true with just a little bit of motivation! Good luck! !